An Auxiliary memory is known as the lowest-cost, highest-capacity and slowest-access storage in a computer system. It is where programs and data are kept for long-term storage or when not in immediate use. The most common examples of auxiliary memories are magnetic tapes and magnetic disks. A magnetic disk is a type of memory constructed using a circular plate of metal or plastic coated with magnetized materials. Usually, both sides of the disks are used to carry out read/write operations. 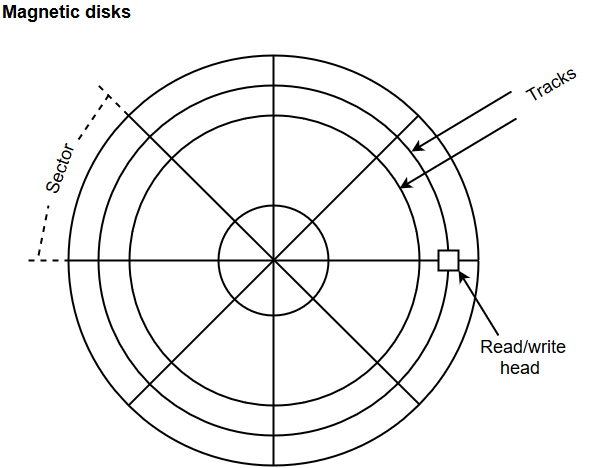 However, several disks may be stacked on one spindle with read/write head available on each surface. The following image shows the structural representation for a magnetic disk. The memory bits are stored in the magnetized surface in spots along the concentric circles called tracks. The concentric circles (tracks) are commonly divided into sections called sectors. Magnetic tape is a storage medium that allows data archiving, collection, and backup for different kinds of data. The magnetic tape is constructed using a plastic strip coated with a magnetic recording medium. The bits are recorded as magnetic spots on the tape along several tracks. Usually, seven or nine bits are recorded simultaneously to form a character together with a parity bit. Magnetic tape units can be halted, started to move forward or in reverse, or can be rewound. However, they cannot be started or stopped fast enough between individual characters. For this reason, information is recorded in blocks referred to as records.